For this week’s iDevBlogADay post, I’m going to share the thought process I went through when creating a “lite” version of Trainyard. What is a lite game? A lite game is a feature-limited and/or content-limited version of a paid game. Lite versions have pretty much always existed in the software world, as things like demos and shareware, so it really isn’t a huge surprise that they also exist up on the App Store. They’re a great way for users to try before they buy. I know for me (and probably a lot of other developers), I didn’t really think lite versions were that important until I read this old Wired article about iShoot, which explains how the game didn’t get popular until the lite version came out, and then it ended up making Ethan Nicholas a ton of money. If you know you’ve got a great game, a lite version is the perfect way to let potential users try it, risk-free. Perhaps more importantly, you’ll reach a much larger user base. I’d wager that the vast majority of App Store users only browse for free apps. There are a couple different ways to do a lite game. The most common is having two separate versions of your game, a normal version and a lite version. There are also other approaches, such as having a single version of your game that’s free, and including the full content as an in-app-purchase (see Landformer for a great example of this approach). For me, wanted to have visibility in both the paid and free charts, because of the different types of users that browse each chart. Do I have to use “lite”? Nope! In fact, Trainyard’s lite version is called “Trainyard Express”. I named it this for a bunch of reasons. First of all, it has a lot more content than most lite versions, which I’ll explain a bit later, so I wanted to get away from some of the negative connotations associated with “lite”. I also really liked how “express” makes sense for a game with trains. I had a look around the store, and found that Adobe Photoshop Express and Sketchbook MobileX are using the express name as well, so it won’t be totally foreign to some users. How much should I give away? This is where it gets tricky. For Trainyard Express, I considered a ton of approaches. The normal game has around 150 puzzles, but at first, I thought about including only the first few puzzles in the lite version and hoping users would see the potential and want to grab the full game. The problem is that during first 10 or 15 puzzles players are just starting to get a feel for the mechanics. The “ah ha!” moments don’t come until 40 or 50 puzzles into the game, where you get a sense for just how cool the puzzles can be. I was left in a bit of a tricky spot. 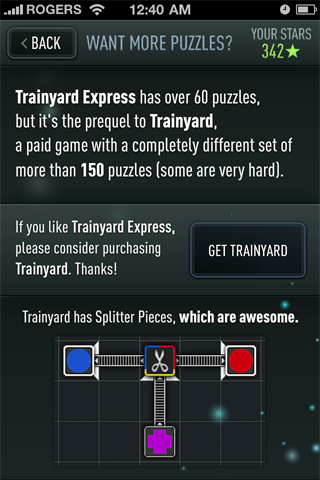 I could give away the first 50 puzzles of the game in Trainyard Express, but then if users decided to buy the full game, there was no smooth upgrade path. They’d have to solve those 50 puzzles again in the full game. I considered adding a cheat to the full game that skipped the first 50 puzzles, but that still didn’t seem like the best solution. Instead, I decided to do something a little crazier. I created 60 brand new puzzles for “Trainyard Express”. A lot of work? Yep, but I really want people to fall in love with the mechanic, and I think this might just be the best way to do it. I also increased the difficulty curve quite a bit, so that the 60th puzzle in Express is as hard as the 100th puzzle in the normal game. Aside from the fact that none of the Express puzzles have Splitter Pieces, it’s completely full-featured. I really want to turn Express players into true fans of the game, even if they never end up buying the paid version themselves (there are tons of users that NEVER pay for games). I spent a lot of time debating whether to enable online solution sharing or not. In the end, I decided it was worth it, even if it destroys my Dreamhost VPS. We’ll just have to see how that turns out. An extra unintended bonus is that because the content is all unique, it’s even worth it for regular Trainyard players to get it as well. I’ve starting calling it a “prequel” instead of a lite version for this reason. I don’t know of any other games that have completely unique content in their lite version except for Jet Car Stunts, which at the very least means I’m in good company. I wanted to keep the app icon fairly similar, but still make it easy to tell it apart. It’s common to see icons with the word “lite” right on them, and even big games like “Angry Birds Lite” do it, but that goes against Apple’s icon recommendations: “Keep your application icons free of terms like ‘sale’,’ lite’, or ‘free’.” Not really a huge deal, but I like the simplicity of an icon without words on it anyway. I went with a pretty soft up-sell strategy. The “want more” screen will only show when you beat all 60 of the puzzles, or if you specifically tap the “Want more puzzles?” button on the main menu. That’s about it! I should note that Trainyard Express isn’t actually out yet, it’s being released 24 hours from now on “Trainyard Thursday” September 30th. Feel free to check it out. I’m curious about other approaches to lite versions, so please post a comment or message me on Twitter if you have some cool things you’ve done or that you’re considering doing in your own lite games. PS: I didn’t want to go into the technical details of how to make a lite version of your app in this post. If you want to do that, take a look at this fantastic post by Noel Llopis of Snappy Touch. PPS: In my research for this post, I discovered that there are a bunch of apps with lite in the title, but they’re actually paid apps. It’s usually “professional” apps, so I understand why they did it, but it still seems a little strange to me. I think they could be a little more creative with their naming. I know I’d have a hard time playing $24.99 for a “lite” app. A very interesting post. Lite is always an extremely touchy, difficult issue – one that must not be dealt with litely (ahem, ahem). I still often second-guess my own decisions that were made when we put out a lite version of 180; we decided to feature one of the 3 modes, and in that it was time-limited to 90 seconds per session – enough time to “get” the mechanic, but not enough to plumb it’s deeper ramifications. I do know this much, that our sales of the Full do better (or at least, no worse) for having the lite out than when we have tried pulling it from the store. Very interested to hear a follow-up to this article and see a comparison of how the lite affected sales – good luck! Sorry! My iDevBlogADay day is Tuesday, so I had to be either 2 days early or 5 days late, hah. I like your strategy of providing a completely unique lite experience, both as a marketing mechanism for the full version and as a reward for past customers. I’ve been thinking about this issue in respects to a game that I’ve been working on – how do we go about creating a “lite” experience that gives players an opportunity to learn the basic game mechanics, but which also provides some “wow” moments that come from actually digging into a game. I think Angry Birds lite does a great job of accomplishing this. They give you just the right number of levels and ramp up the complexity in such a way as to allow players to learn the basics, feel challenged, feel rewarded, and most importantly – get just a little bit addicted. I’m interested in your thoughts regarding timing the release of a “lite” version. Trainyard express is being released after the launch of the full version of the game, but if you had to do it all over again … before, at the same time, or after the launch of the full version? Great blog, article, and insights. Angry Birds does an amazing job with their lite version. It’s no doubt that’s a huge contributing factor to their success. I think their game mechanic works perfectly for a lite version too. Your timing question is interesting. I definitely think I waited too long (it’s been over 3 months since Trainyard was released), but I wouldn’t release it at launch either. I’ve found it takes a lot of effort to market a game, and I wouldn’t want to split that effort between two products, even if they are, technically the same game. The other thing is that a lot of people will buy your game at release because of launch buzz and all that, so you might as well push them to your paid game. I had always planned on doing a “lite” at some point, but didn’t really focus on it until sales of the paid version started slipping. I was searching for a post like this last week, I was working on the lite version of Hex Reaction ( if you want to try it it’s Hex Reaction Free ). a) My original game has 13 levels, but for the free version I wanted to give away around 7, so I re-balanced those 7 levels to deliver a fun experience. In the original game, the fun does really start in level 5-6 , so I felt that re-working on the curve was the right thing to do for the free version. b) I did the same thing with my music, I included 2 of 3 of the original tracks, but included the ones that made more sense with the new difficulty curve. c) The Icon is actually very similar to the original app Icon too, didn’t want to include the words “Lite” or “Free” on it. This post couldn’t have been timed better. I’m presently working on a new game and wanted to do a lite version. I was initially just going to include the first 10 levels, but I like how you included completely separate levels and I think that’s the route I want to go too. Thanks a lot of for the insight into your process and I will be looking forward to Trainyard tomorrow. Very cool perspective on making a “lite” version. I’m in the final stages of my iPhone game, and I’m going to have a full (paid) version, a “lite” or limited version (which will probably be the same game, but only 3 or 5 levels instead of 10 and less achievements) but I’m also going to be doing a Facebook version of the game that will be free for all as an alternate “here’s something to let you play that doesn’t cost money and will hopefully get the word out” which is basically what the lite version is for, right? I like your idea about adding in unique/extra content that the full version doesn’t have — that might even encourage big fans of the app to have both versions on their devices at once. The free Facebook/web game route is something I’d like to do eventually too. I’ve already written the Trainyard engine in Flash, I just have to make the menus and a couple other things. I think that has the potential to drum up buzz and sales just as much as an App Store lite version does. That’s exactly what I’m hoping for — that it’ll get the word out about the game, which seems to be the biggest obstacle in iPhone game/indie development right now. Planning on sticking it in a few game portals as well, with iPhone ads for my game intact. We’ll see. I’d definitely encourage you to go that route if you can. I just came across your game and blog via the Cocos2D feed. Really fun well executed game, played the express version and bought the paid app. I’ll certainly be recommending it to my iPhone owning friends. Nice work and congrats on the payoff, well earned! And thanks for sharing all that info. I’m hoping to pluck up the courage to be as open myself with an iPad app I have on the way. Just downloaded the free version earlier today and played a couple levels. Seems awesome so far. I’ll probably buy it soon as I always buy apps I like. You really can’t deny a $.99 price. Glad things are working out for you, I wish you a lot of success!